Nebraska Game & Parks describes Ash Hollow as the state's "most intriguing and unusual" state park. Relics of bygone ages mingle with more recent yesterdays to present a kaleidoscope of time found in few places in the High Plains. Here have been found the bones of prehistoric rhinoceros, mammoths, and mastodons, all ancient mammals that once roamed the Great Plains. Settlers on their way west came through the area starting in the 1830s and called the valley "Ash Hollow" because of the ash trees growing there. 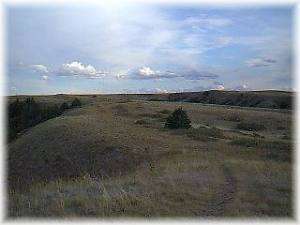 Modern travelers can view the deeply eroded ruts on Windlass Hill, where wagons were winched down a treacherous passage. They can also visit the cave shelter that migrating Indians used for thousands of years, view relics of the Blue Creek Massacre site near Ash Hollow, and visit the tiny stone schoolhouse that served early settlers' children. The modern visitor center interprets the geological, paleontologic, prehistoric, native American Indian, military, and 19th century fur trappers, explorers and pioneers. A 16-minute visual show traces how man used Ash Hollow from prehistoric times through the emigrant days of the mid-1800s. The Ash Hollow Indian Cave, now covered with a building for protective purposes, further interprets the geologic history. More than 30 million years of geologic history can be examined at the park. the geologic history of rocks exposed in the park spans that many years. A large number of fossils from various species including Tertiary mammals can be found in sediments and rocks in the area. Ash Hollow was a principal stopping point on the Oregon, California, and Mormon Trails with some 400,000 to 500,000 emigrants passing through or by Ash Hollow. As a part of the park, Windlass Hill, described by emigrants as the "steepest descent east of the Rockies," is located on a separate tract 2 1/4 miles south on U.S. 26. Development there includes an interpretative shelter and informal signs. A concrete walkway provides access to the crest of the hill to view the deep ruts carved by those thousands upon thousands of wagons that traveled the trail those many decades ago. Interpretive Center, Visitors Center and Cave open daily, May 5 to September 5, 9:00 a.m. to 5:00 p.m.